Potty training your child shouldn’t require an instruction manual the size of a telephone book, nor should it require a visit to your pediatrician. It certainly shouldn’t involve a private consultant’s assistance! Yet you may be like many other parents who get the idea that this is a complicated, difficult undertaking, and can’t possibly be done with ease. I have good news. As a parent educator and four time veteran of the toilet training process, I know that potty training can be simple, pleasant, and yes, even fun. I’ve written this guide so that you can sail through the potty training process easily and joyfully with your child. The perfect age to begin potty training is different for every child. Your child’s best starting age could be anywhere from eighteen to thirty-two months. Pre-potty training preparation can begin when a child is as young as ten months. Teaching your child how to use the toilet can, and should, be as natural as teaching him to build a block tower or use a spoon. No matter the age that toilet training begins, most children become physically capable of independent toileting between ages two and a half and four. The age that a child masters toileting has absolutely no correlation to future abilities or intelligence. A parent’s readiness to train is just as important as a child’s readiness to learn. Training need not be expensive. A potty chair, a dozen pairs of training pants and a relaxed and pleasant attitude are all that you really need. Anything else is truly optional. More than 80% of children experience setbacks in toilet training. This means that what we call “setbacks” is really just the usual path to mastery of toileting. 98% of children are completely daytime independent by age four. 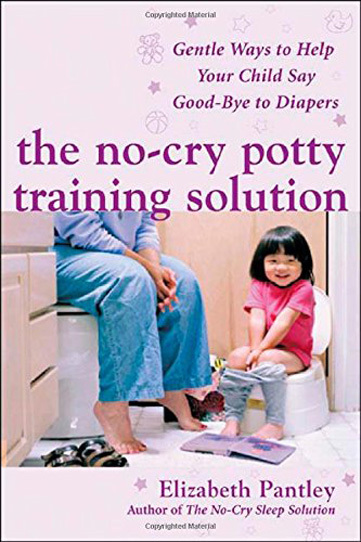 Excerpted with permission by McGraw-Hill Publishing from The No-Cry Potty Training Solution (McGraw-Hill, 2006).